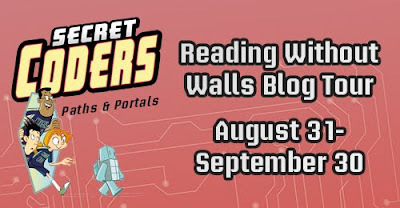 I'm so thrilled to be part of the Reading Without Walls Blog Tour! I firmly believe in the idea of reading outside of your comfort zone - whether that means a new topic, format, genre, or characters that are not like you. Expanding our horizons, and those of the readers under our care, is the best way to make positive change in the world. In Paths and Portals - we jump right in where the first left off. Kids may want to do a quick reread of the first one to help them remember exactly what was going on at Stately Academy. 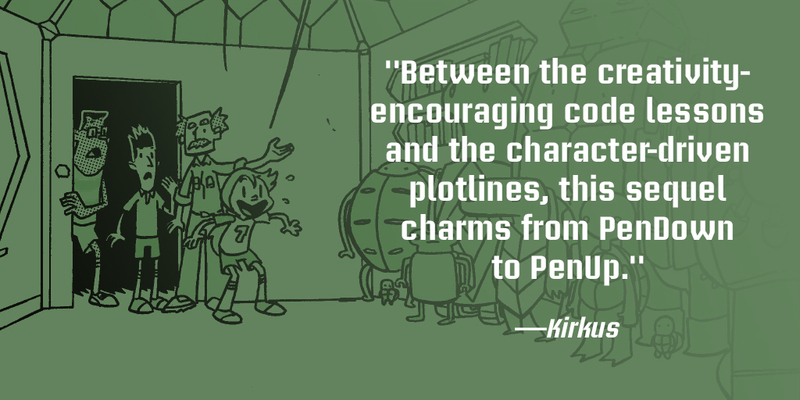 (Which, for the record, is another beautiful thing about graphic novels. Kids are generally thrilled to do rereads of old titles, helping them discover new things each time.) 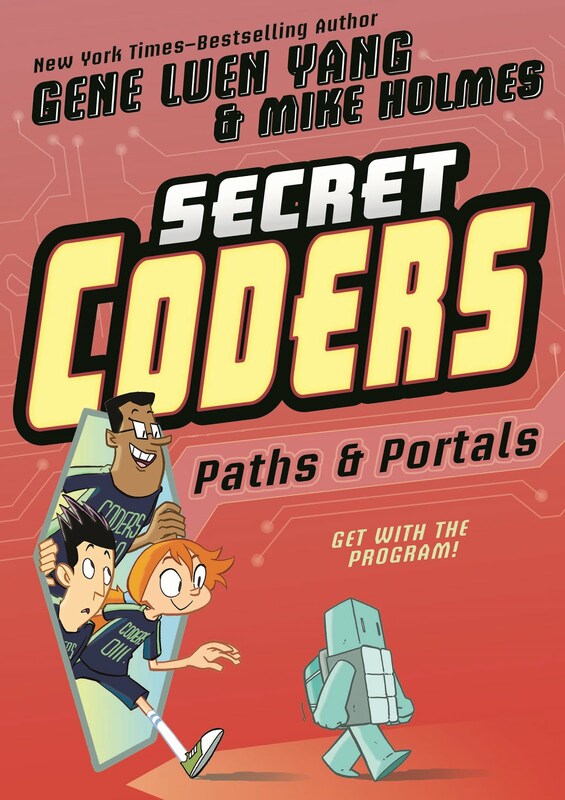 Hopper continues to build her coding skills, and invites the reader along for the journey. 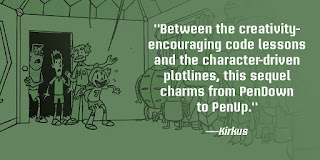 The narrative frequently pauses to ask the reader "can you do this?". What I love best about that is the fact that Hopper's solution is presented as just "one way" the problem could be solved. Who will love these books? My classroom is targeted toward advanced students in grades 2-5. 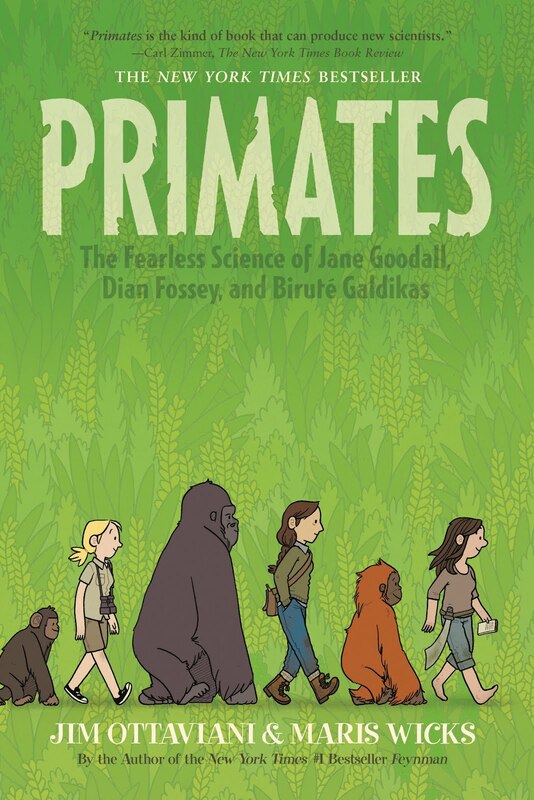 I found that my younger kids (2nd and 3rd graders) were the ones most drawn to the first book in the series. They are kids who love math, science, and coding. 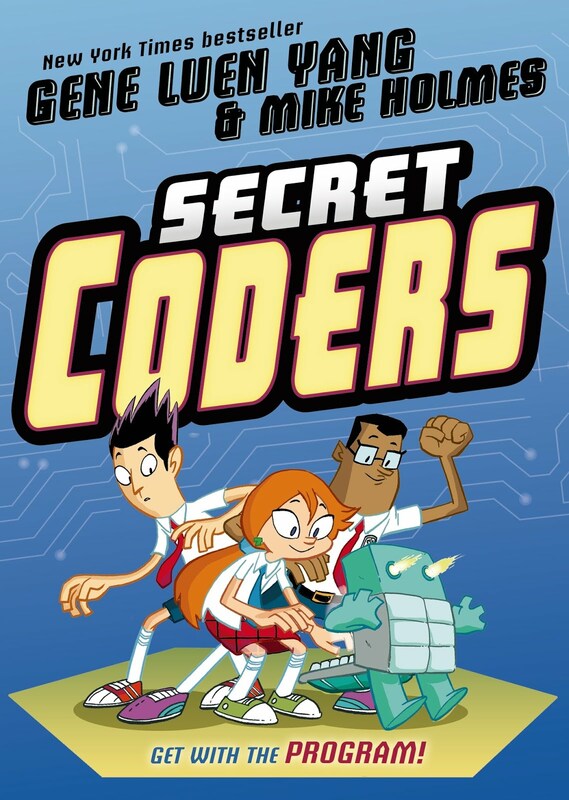 With the recent emphasis on computer science with international initiatives like Hour of Code, I think this series will appeal to upper elementary kids who are beginning to dive into the world of coding. -- Kids love puzzles. Help them learn more about binary and other base systems in math. -- Set them up for the courses on the Hour of Code site. There are some that are designed to be a single hour or two, and others that will help them build more sophisticated skills in code. -- Who is Hopper named after? Kids will be fascinated to learn more about Grace Hopper! 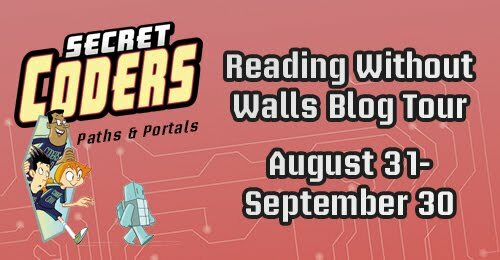 As the second part of the Reading Without Walls Tour, we got the chance to dive into one of the MacMillan's STEAM books. 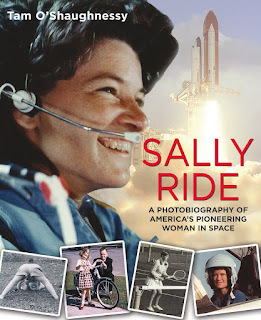 I gleefully chose the Sally Ride photobiography, since I'd been eyeing that one for purchase for my classroom this year. Well - SOMEONE has to be the first - and that someone becomes an inspiration to future generations. 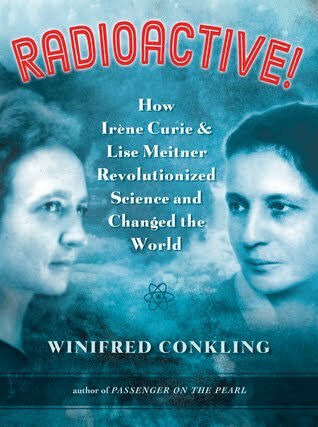 I'm currently reading Radioactive!, a book about Irène Curie and Lise Meitner. Meitner's story begins with the description of how Marie Curie's life inspired her to realize that women could have a career in physics. We need to fill the walls and shelves of our classrooms with the stories of the men and women who broke barriers in all fields to help the next generation see themselves everywhere they'd love to be. I've always loved science and science fiction. Some of my fondest childhood memories are of watching shuttle launches with my parents. 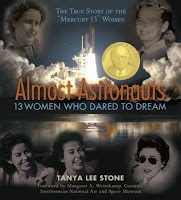 Sally Ride was one of my earliest heroes, and I don't know that I fully realized how amazing it was that she was part of the "Thirty-Five New Guys" that trained to be part of the newest NASA missions. Now, having read more about the women who tried to break in earlier, it means even more to me to learn about her life and accomplishments. I love that Sally Ride followed her dreams - as we want all of our students to do. 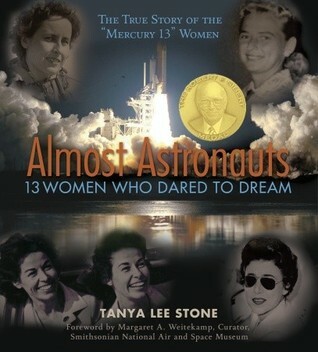 I also love that she dedicated her post-astronaut years to helping children - with a focus on girls - learn more about science. My goal is to continue her work and make sure all of my students can see faces that look like them in any field they long to join.